At the Congress for the New Urbanism’s (CNU) Charter Awards Ceremony in Seattle on May 5, the Form-Based Codes Institute (FBCI) announced that Palm Desert, Calif., and Nashville, Tenn., had received the 2017 Driehaus Form-Based Codes Award for their implementation of innovative and effective codes. The Driehaus Form-Based Codes Award is sponsored by FBCI with the generous support of the Richard H. Driehaus Charitable Lead Trust. Nominated codes were critiqued by a four-member jury of peers. Mention Palm Desert and many attractive features come to mind: mid-century modern architecture, luxury retail businesses, resort living and world-class golf, to name just a few. Walkable neighborhoods, an interconnected network of multi-modal streets and mixed-housing neighborhoods centers are not commonly associated with this widely known desert city, yet those are just what Palm Desert’s new general plan and University Neighborhood Specific Plan call for. The city’s leaders, with the support of the community, have decided that such places are the next missing pieces to add to its attractive repertoire, to diversify its lifestyle offerings as it matures in the 21st century. Palm Desert was founded in 1945 in Riverside County as a 1,600-acre resort destination for celebrities and politicians on “the Grapefruit Highway” (Highway 111), connecting Los Angeles to Tucson and other destinations east. Its first neighborhood was marketed as a close-knit model of desert living where residents could walk or bike to local shops. Over the next 60 years, the city grew to cover more than 27 square miles based on the prevailing suburban development models of that time, introducing a grid of high-volume, high-speed six-lane arterial streets connecting – and separating – inward oriented housing tracts, and strip shopping centers. The majority of those housing developments were focused on retirement living, featuring golf courses and one-story houses, and big yards for enjoying outdoor desert living. Looking to the future, city leaders initiated a strategic planning process in 2012, engaging the National Civic League to structure a community-based discussion of the city’s future. The process included a number of community surveys, dozens of community meetings, and a year and a half of work by a number of resident-led committees. The result was the “Envision Palm Desert” report, which identified top community priorities: attracting and retaining younger residents, balancing housing with new local jobs, and supporting higher education. Topping the list of strategies for achieving these goals was developing a “real city center” for Palm Desert and developing new walkable, bikeable, mixed-use and mixed-income neighborhoods both as part of the city center, and in a new university district anchored by a new California State University branch campus in North Palm Desert. To put the strategic plan into action, the city retained a consultant team led by Raimi + Associates to update its general plan, including a plan to transform the old Highway 111 strip in the center of town to “Boulevard” 111. One block south of 111 is El Paseo, Palm Desert’s very walkable high-end shopping, arts and entertainment street, which was developed, ironically, in the 1970s at a time when so many other cities were letting their main streets decline and moving retail activity to suburban shopping malls. Through a series of workshops and design studies, a new vision for Boulevard 111 was agreed upon, transforming 111 from a “rip” – a physical barrier separating El Paseo from the neighborhoods and the civic center to the north – to a “zipper” that connects them. The team prepared the city center plan as a chapter of the new general plan, and new form-based zoning and public realm standards to implement it. Based on the success of the city center work, Palm Desert retained the same consultant team – led this time by Sargent Town Planning (STP) – to prepare specific plan and form-based code for a 168-acre city-owned property near the new university campus. In the early work on the plan, the team noted that 200 acres of adjacent, previously planned and entitled – but currently unbuilt – conventional suburban housing tracts separated the city’s land from the campus, limiting connections to trails along arterial streets and overall circulation opportunities. Those previously approved tract maps were on the verge of expiring, and the property owners agreed to be part of the new plan in return for new entitlements permitting additional housing units on the condition that those units be delivered in a form consistent with the vision of the University Neighborhood Specific Plan. University malls, promenades and other public spaces will contribute to the UNSP’s integrated community character. The university neighborhoods, along with the planned campus expansion to the east and other adjacent development, comprise a university district of almost 1,000 acres at the north gateway to Palm Desert. Separating the neighborhood from the campus is Cook Street, a major north-south arterial corridor connecting from Interstate 10 to the city center several miles to the south. An important element of the plan is the transformation of Cook Street, which entailed converting the outer travel lanes to on-street parking and bike lanes, thereby calming the traffic and enabling new development to front Cook directly rather than huddling behind walls and parking lots. The result is a walkable mixed-use corridor that reconnects campus to the new university neighborhoods. The STP team engaged the university’s campus planning team and obtained the university’s enthusiastic support for this change. Additionally, a future Cook Street shuttle or bus rapid transit is planned to connect the university district to the city center to the south, along with a potential future passenger rail station. To structure this new neighborhood, the STP team prepared a conceptual neighborhood plan organized by an interconnected network of complete streets throughout the plan area and connecting to the campus to the east. The focus of the plan is a new, mixed-use neighborhood center around a town green with local retail, restaurants, boutique office space, live-work opportunities, and a range of multi-family and attached single-family housing types. The neighborhoods are planned for a flexible mix of housing types – primarily single family attached and detached – organized around a network of small neighborhood parks and greens, connected by pedestrian-scaled neighborhood streets. The code’s regulating plan applies three form-based zones to the university neighborhood planning area. The Neighborhood Low zone is intended to create a quiet neighborhood environment with single-family detached housing types on a range of lot sizes, and may include some single-family-attached and small multi-family “house-form” types that are compatible with houses in scale and character. The Neighborhood Medium zone includes those house-form types as well as courtyard housing and multi-family apartment buildings up to three stories in height, with building-scale standards. The Neighborhood Center zone is mixed in use, including ground floor retail, office and housing, allowing bot rental and ownership options. Finally, an Open Space zone reserves key locations for neighborhood and community-serving open spaces, such as the central town green, neighborhood parks of various shapes and sizes, and a large linear natural green space that fronts major arterials along the south and west borders of the planning area. “In writing an FBC for a large area, which will take many years to complete, a core goal is creating long –term value that will accrue both to the community and to the master developer,” said John Baucke, president and CEO of New Urban Realty Advisors, Inc., who served as theSTP team’s development advisor, contributing a developer’s perspective to the project. Because the district will be developed in phases over time by multiple builders and probably more than one master developer, and under changing market conditions – the code starts by defining “framework streets” that provide primary internal and external access and connectivity for the plan area, and organizes the planning area into a series of sub-areas. The exact alignment and design of the framework streets is somewhat flexible, as are the final sizes and configurations of blocks and lots, but the basic connectivity and design character are fixed by the plan. The code starts with a section called “Subdivision Standards,” which walks the user through the process of finalizing the alignment and design of the framework streets, and organizing each sub-area into a walkable neighborhood area. Prior to any development within a sub-area, the code requires that the developer prepare a precise neighborhood plan for that area, defining with precision the layout of streets and blocks, which streets will be connected to adjoining sub-areas, which specific building types are intended, and the design and landscaping of all streets, parks, greens and alleys. Block sizes and shapes are flexible within parameters, with lot sizes and alleys, or no alleys, defined by intended building types and connectivity requirements. The code provides a system of street typologies, to be assigned based on the intended function and environment of that street (e.g., an active mixed-use center, a neighborhood edge, a neighborhood connector, or a quiet neighborhood street). To further customize each street to its buildings, the code provides a range of public frontage types that describe the design configuration and character of the streetscape elements between the vehicular travel lanes and the buildings. These are calibrated to the intended ground floor use/activity of the adjacent private development, configuring on-street parking, street trees and landscape, street lighting and furnishings, and in some cases bike lanes. The result is intended to be an interconnected, safe, comfortable and attractive, multi-modal network of public spaces that provide unique, high-value addresses for buildings that front them. A variety of public open spaces including edge greens, attached and detached neighborhood greens, pocket parks, paseos and rosewalks (pedestrian “streets” defined by building frontages), and alleys complete the public realm network. Alleys are required for narrow-lot, single-family and multi-family housing types, and at transitions from residential to commercial ground-floor use. The code employs simple form-based development standard techniques for all buildings, focused on their size, placement and frontage. Frontages modulate the degree of privacy for ground floor spaces, ranging from low front-yard fences and climate-calibrated landscape, dooryards, terraces, porches stoops and commercial shopfronts and arcades. The code also includes standards for building scale and massing, regulating the expression of horizontal increments to ensure that the apparent scale of buildings within each zone and within each block fall within a harmonious range. Unlike many of the earlier codes by the firm and other West Coast practitioners, the standards do not explicitly include “building types”; rather, they are provided as part of an extensive design guidelines appendix, bound in a separate volume. The guidelines cover a wide range of topics including basic material and technique guidelines, landscape guidelines, and style-specific guidelines for a number of regionally significant architectural styles including Spanish colonial revival, mid-century modern and others. The code requires that that the Precise Neighborhood Plan assign these elements street by street and block by block, for city review and approval as a unified package. In preparing the development standards and design guidelines, a universal consideration was the nature of outdoor spaces at all scales. The integration of interior and exterior spaces has always been a defining characteristic of the “desert lifestyle,” including expansive views of neighborhood landscapes through the heat of the day, and the occupation of those spaces on winter days and long, warm evenings. Recent trends in market-based development types in Palm Desert were shifting directly from the very large lot, sprawling one-story homes to very small lot two-story homes with virtually no yard space. The University Neighborhood Plan proposed and intermediate possibility: relatively compact forms of two- and three- story housing that defines comfortable, pleasant, shady, wind-protected yard spaces well-connected to interior living spaces. The code’s building siting and massing standards – and the building-types in the design guidelines, define such spaces that range from small side-yard patios to modest rear yards to semi-public dooryards, to courts, gardens and rosewalks shared by households in single family and multi-family compounds and buildings. And in the neighborhood center, siting and massing standards are provided to organize buildings around shared plazas, squares, and greens. Although Palm Desert’s city council was wholeheartedly in favor of the STP’s focus on turning the university district into a connected, walkable community, the development team faced some significant challenges to some of its proposals at first. One such example was the re-imagining of Cook Street. As expected, finding developers willing to buy in to a community of this type requires patience, and it has. While the University Neighborhood Plan was in administrative draft form, a large, well-financed master developer expressed interest in buying and developing the northerly half of the planning area, hiring a land planner to lay out the neighborhoods. That initial concept plan was prepared without regard to the code, minimizing the public realm and connectivity and relegating “pedestrian connectivity” to a trail system running behind lots. The city indicated its support for the model proposed by the plan and code, and authorized the Sargent team to prepare a plan variation that met many of the developers housing type objectives in forms consistent with the plan, which generally was well-received. “The developer hasn’t lost interest in building on the property and has taken what we did back to the drawing board. In fact, they’re talking about acquiring and developing the other 170-acre parcel, too,” said Ryan Stendell, the city’s community development director. He praised the team’s development advisor John Baucke and economist David Bergman, for helping the team to anticipate the developer’s concerns. “The master developer is moving forward because, looking at the property and the city’s plans for it from a market and financial perspective, it offers a strong potential to generate both short-term and long-term value,” said Baucke. The jury that awarded Driehaus Form-Based Code Awards to Palm Desert, called it “an excellent example for regulating large-scale infill development to produce a walkable place,” and for providing “’a kit of parts’ for creating the fundamental urban form — addressing both the public realm and private development and achieving the ideal balance between predictability and flexibility. It creates a regulatory framework and process within which future detailed planning and development can take place. This code is elegantly designed, with clear and attractive images throughout and an appendix of beautifully illustrated design guidelines,” the jury declared. No From Desert to Oasis: Transformative FBC Will Help Turn a “Big Blank Piece of Sand” Into a Diverse, Attractive Community classes are currently scheduled. Contact FBCI to learn more about upcoming classes, or browse recorded webinars for learning opportunities available online anytime. Chairperson Lisa Wise will represent FBCI at the Global Cities in an Era of Change 2016 symposium, March 30-April 1, at Stanford University in Palo Alto, Calif. The symposium will unite thought-leaders and decision-makers to address the challenges and opportunities the real estate industry faces as the built environment adapts to meet the needs of global urban population. The broad range of topics to be discussed include defining the global city of the future, how to prepare for and confront cyber and domestic terror threats, global capital flows and how autonomous vehicles will affect cities. Wise will join three other distinguished panelists to discuss the “Reinvention of Cities.” She will be joined by Andy Cohen, co-CEO at design and architecture firm Gensler, Colin Shepard, CEO of Investment Management in Hines’ Office of Investments and Ed Friedrichs, former Gensler president and CEO and founder of the consulting firm Friedrichs Group, LLC. The panel will discuss the new types of cities that are emerging and how they are leveraging cutting edge technologies, infrastructure, design, and planning techniques to create urban areas that fully accommodate professional activities and social, sustainable residential neighborhoods. “If we are going to accommodate future populations in a sustainable manner, we need a significant transition to a renewable and energy efficient economy and best practices in urban planning,” Wise explains. “The key components of successful city reinvention from an urban planning perspective require greater public awareness of the need for this transition, prioritization of infrastructure investments, more accessible and flexible financing strategies. “Like the panel discussion in which Lisa will participate, many other presentations during the symposium will include a focus on sustainability and smart cities. By attending, FBCI leaders will have the opportunity to meet key influencers in disciplines who need to know about form-based codes while gaining a global understanding of multiple forces changing cities,” said Carol Wyant, who serves on the FBCI’s and the Stanford Professionals in Real Estate’s (SPIRE) boards of directors. SPIRE is co-presenting the symposium with The Counselors of Real Estate (CRE) and RICS. To learn more about the symposium and to register, visit the event website. No Lisa Wise Will Discuss the Future Development of Cities at Prestigious Real Estate Symposium classes are currently scheduled. Contact FBCI to learn more about upcoming classes, or browse recorded webinars for learning opportunities available online anytime. Since 1981, approximately 400 form-based codes (FBCs) have been prepared for communities across the US, and as of 2012, 252 of them have been adopted. Eighty-two percent of the adoptions have taken place in the past 10 years. But as exciting as that may be, what’s more exciting is that these numbers are miniscule when you think about how many communities exist in the U.S. If this reform of conventional zoning is increasingly gaining acceptance and being applied to larger areas, why are there still so many misconceptions? FBC must be applied citywide. To my knowledge, Miami, and Denver are the only US cities that have applied form-based coding to all parcels within their boundaries. In general, FBCs are applied in two ways: to a site to implement a development project or to several areas as part of a zoning code amendment or update. This second category sometimes involves reconfiguration of the zoning code to retain a set of conventional zones for “automobile-oriented suburban”patterns while adding form-based zones for “walkable-ur-ban” patterns. This is called a hybrid code because it merges the conventional zoning and form-based zoning provisions under one cover, in one set of procedures. FBC can’t work with design guidelines guidelines, and complicates staff review of projects. Because conventional zoning doesn’t ask a lot of questions, most planners have had to learn what they know about design on the job, and need design guidelines to fill in the gaps left open by the zoning. That’s how I learned. A well-prepared FBC doesn’t need design guidelines because it explicitly addresses the variety of issues through clear illustrations, language, and numerous examples. However, we are not allergic to design guidelines; the key is to make sure that the guidelines clarify what is too complex, variable, or discretionary to state in legally binding standards. From its outset nearly 35 years ago, form-based coding exposed the inabilities of conventional zoning to efficiently address the needs of today’s communities. Today, form-based coding is a necessary zoning reform—one of several important tools that communities need to position themselves as serious candidates for reinvestment. No Misconceptions About Form-Based Codes classes are currently scheduled. Contact FBCI to learn more about upcoming classes, or browse recorded webinars for learning opportunities available online anytime. Tony Perez, Opticos Design’s Director of Form-Based Coding, has gone back to school this spring, teaching a graduate-level studio dedicated to Form-Based Coding at California State Polytechnic University in Pomona, CA. While some universities invite guest lecturers to speak about FBCs, Perez’s class, “Form-Based Codes in the Context of Integrated Urbanism,” is one of the only full courses on the subject in the country. An illustration of the six Transect zones as applied to Flagstaff, AZ. Throughout the spring quarter, Perez will discuss the reasons and purposes for FBCs, where they do and don’t apply, what type of information is needed to write an effective FBC, and how to coordinate an FBC with a community’s public policy. Students will explore the neighborhoods, districts, corridors, and centers of their individual study areas—one-square-mile of a Southern California community—and their relative status and condition. They will work with their study area for the duration of the quarter, focusing on one pedestrian-shed, and will be tasked with developing a vision, policy direction, illustrative plan, and code framework that includes a regulating plan and the implementing zones. Andrews University teaches students how to use the SmartCode for their urban design projects while some universities address FBC as part of their urban design programs but do not offer similar courses on FBC preparation. Perez says that a discussion of the physical realities and exciting information about how towns and cities are built—the urban components that comprise each place and the subsets of components that comprise each area and its individual features—is largely missing from most urban planning programs, including when he was in school. That’s how he got started working with FBCs nearly 15 years ago. “When I realized that this tool could see those realities in ways that the current system could not, that was an exciting day,” he said. At the end of the course, students will be expected to understand the real differences between conventional land use-based zoning and Form-Based Codes, as well as be able to describe the overall process of what one needs to consider when working to apply an FBC to different types of areas. Equally important, he says, is that the students begin looking at the world as it presents itself: as a composite of varied physical components in different combinations that we occupy at different times of the day or night. An example of shopfront standards from a draft of the Tehachapi, CA, code. Julianna Delgado, Interim Associate Dean of Cal Poly Pomona’s College of Environmental Design and a professor in the Department of Urban and Regional Planning, came up with the idea of a introducing a full course on Form-Based Codes at the school. Delgado says she and Perez got to know each other while attending various FBC-related conferences. “If you want someone to teach something to your students, you ask the best person you know,” she says. The mission of the California State University system is to train California’s workforce but there are no other formal courses on Form-Based Coding. Delgado says she wants her students to understand that the formal basis for a community is as important as land use—walkability, appropriate architecture, public space and the public realm. “So many communities in California are looking toward FBCs, that giving our students a learning system that is less theoretical and more rooted in practice, would put them at the forefront of the planning profession,” she said. At Cal Poly Pomona, Delgado says it’s “learn by doing.” Down the road, Delgado imagines developing a studio course that would develop a Form-Based Code for a California community. “There are many ways to develop this into design courses as well as administrative courses for implementation. There’s a lot that can be done and I’m honored to be able to help the next wave of practitioners,” Perez adds. No FBCI Instructor Goes to School for Form-Based Codes classes are currently scheduled. Contact FBCI to learn more about upcoming classes, or browse recorded webinars for learning opportunities available online anytime. Hartford Business.com quotes Joel Russell, Executive Director of Form-Based Codes Institute and Alan Mammoser, Program Director on how the Hartford Group and the town of Simsbury, CT developed a form based codes and are using it to market the Farmington Valley office campus. Joel Russell, a Northampton, Mass., attorney and planning expert who has done extensive work on form-based code through Yale and his own consultancy, said The Hartford’s application of a form-based code to marketing an existing development appears to plow fresh ground. “It’s a unique way of doing it and an extremely good model,” said Russell, executive director of the Form-Based Codes Institute based in Chicago. “They’ve essentially solved the problems of community acceptance up front,” Russell said. Form-based coding has evolved since the early ’80s, with the code for the community of Seaside, Fla., said Alan Mammoser, program director at the Form-Based Codes Institute. More recently, Miami, Fla. adopted form-based coding to address concerns that oversized commercial buildings were encroaching into neighborhood spaces and making streets less navigable to cyclists and foot traffic, Mammoser said. No Joel Russell quoted in Hartford Business classes are currently scheduled. Contact FBCI to learn more about upcoming classes, or browse recorded webinars for learning opportunities available online anytime. The City of Bridgeport, Connecticut has become the first City Sponsor of the Form-Based Codes Institute. City Sponsorship gives city planning staff free access to FBCI webinars as well as expert guidance and education on how to reform city zoning and use form-based codes. FBCI welcomes Bridgeport to FBCI and urges other cities to follow its example and join forces with us to transform zoning codes throughout America. Any community wishing to become a City Sponsor should contact Joel Russell, Executive Director of FBCI at joel@formbasedcodes.org. We offer special introductory benefits to cities that join before September 20, 2014. No Bridgeport, CT Becomes First FBCI City Sponsor classes are currently scheduled. Contact FBCI to learn more about upcoming classes, or browse recorded webinars for learning opportunities available online anytime. The Form Based Codes Institute is pleased to congratulate the City of Cincinnati for its Grand Prize Award at the Congress for New Urbanism’s Charter Awards for the creation of a CityWide Form Based Code. Cincinnati is the first to receive this award under the newly created category Best Planning Tool or Process. Opticos Design lead the effort to develop the new code. No Cincinnati Form Based Code takes CNU’s Grand Prize classes are currently scheduled. Contact FBCI to learn more about upcoming classes, or browse recorded webinars for learning opportunities available online anytime. Sundance Square in downtown Fort Worth, TX, which was developed under form-based standards. Image: Randy Hutcheson. Although the 1926 Supreme Court decision of Village of Euclid v. Ambler Realty Co. validated the use of municipal power to separate land uses for “public welfare,” conventional zoning has just as often been used as a tool for social separation. Throughout the 20th century, cities have used zoning as a way to separate not only uses—like residential, commercial, and industrial—but also people according to wealth, class, and race. 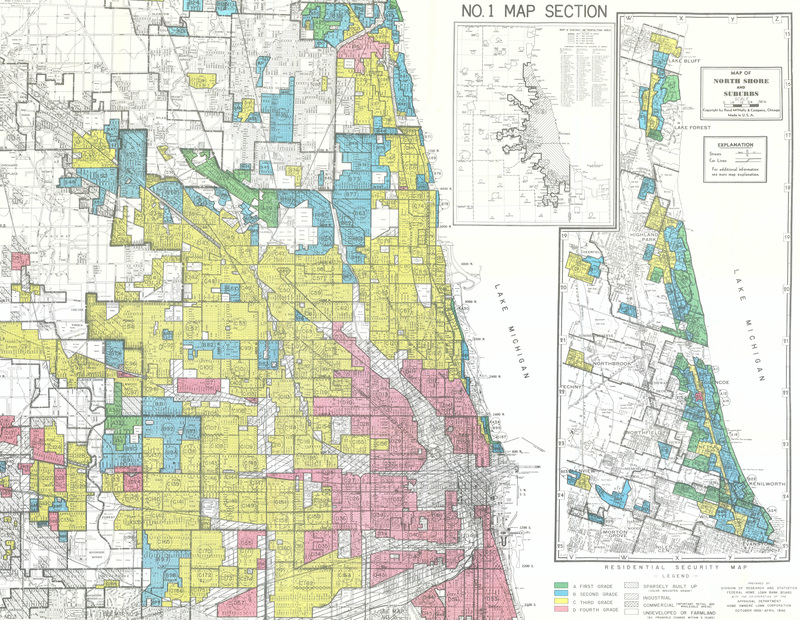 A quick look at Chicago reveals how today’s uneven distribution of prosperity spawns from a history of zoning to exclude and separate. Today, affordable housing is concentrated in a few majority-minority neighborhoods zoned for small lots or multifamily housing while single-family zoning covers substantial swaths of the city, primarily in whiter, wealthier neighborhoods. The divide between these two residential zones often closely mirrors the redlining maps of old that—along with other insidious tools like racial covenants—directed investment away from low-income and minority neighborhoods and were used to keep African Americans and other people of color out of white communities. Chicago isn’t unique in this regard; zoning in many communities continues to keep people of color out of white neighborhoods while concentrating poverty in select zip codes, even if that’s not the intent. But instead of being a tool for segregation, if done right, zoning can be a tool for creating more equitable, just communities. Form-based codes present a particularly promising strategy when confronting segregation. From the very start, this type of zoning uses an exhaustive community visioning process to inform the physical character and design of a community. And rather than separating housing from jobs and services, form-based codes encourage a mix of uses—and a greater diversity of housing types—which can dramatically cut transportation costs by allowing people to live closer to where they need to go. If crafted thoughtfully, zoning reform can address ingrained inequities, especially when paired with other equity-driven initiatives for developing/preserving affordable housing, preventing displacement, and supporting small businesses. Community benefit program: Allowing taller buildings or more housing units in exchange for a certain “community benefit” is one way to encourage developers to include important resources or features in their projects. New Rochelle, NY‘s form-based code offers developers up to four additional floors if projects include greater energy efficiency, attainable space for low-income artists, historic preservation, affordable housing, or certain community facilities. Developers can alternatively pay into a community benefit fund that supports workforce training, job placement services, and relocation assistance for residents and businesses. The Arlington Mill Residences on Columbia Pike is a four-story, 122-unit complex that is 100 percent affordable (for 60 percent AMI). It includes 98 two- and three-bedroom units to support larger families and 13 units designated for formerly homeless individuals and families. Image: staff photo. Affordable housing requirements: Some form-based codes require developers to provide a minimum amount of affordable units for low- and moderate-income residents. This provision is often adopted along with other complimentary affordable housing programs in places like Columbia Pike in Arlington County, VA where 20–30 percent of net new units must remain affordable for 30 years to households earning up to 60 percent of the area median income. Small business sensitivity: Zoning regulations for commercial development can be designed to support small or minority-owned businesses and help retain local workers. Winooski, VT‘s form-based code permits smaller-than-usual business frontages to enable affordable space for immigrant-owned restaurants. Approval priority: Expedited approval and reduced review fees are being used to reward projects that include affordable or workforce housing under Bradenton, FL‘s form-based code. Conservation strategy: The form-based code for Columbia Pike in Arlington County, VA also includes a transfer of development rights and conservation area standards to protect sensitive properties and preserve existing affordable housing units. 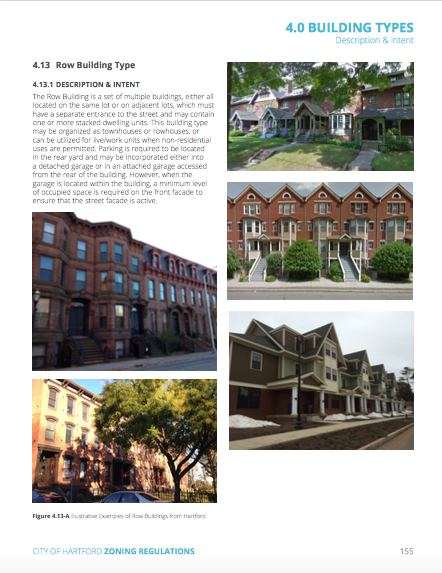 Hartford’s zoning regulations include a description of various building types with local examples, as seen above for the “Row Building Type.” Image: City of Hartford. Expanding housing choice by regulating form, not density: Form-based codes enable an array of building types that fill the void of missing middle housing—things like cottage apartments, bungalow courts, and triplexes—that can create smaller-sized and more affordable dwelling units. Fort Worth, TX, for example, permits accessory dwelling units by right without restricting size in its Near Southside form-based code and Hartford, CT’s form-based code allows for stacked flats and row buildings in most neighborhood districts. And when communities open up formerly exclusive, single-family areas to these types of housing, a wider array of people can live in them. And with more people—and the more walkable street grids that form-based codes promote—these neighborhoods can better support and be served by public transportation. Adjusting parking requirements: High minimum parking requirements typically require developers to construct expensive parking, the cost of which gets passed onto renters (whether they own a car or not) through higher rents. Reducing or eliminating these costly requirements around transit stops, in walkable neighborhoods, or on properties with affordable housing can improve affordability. A citywide form-based code for Miami, FL makes gentle density and missing middle housing more economically viable by eliminating parking requirements in urban neighborhoods. Alternatively, cities like Seattle require developers to “unbundle” parking cost from housing costs, so that only those who need parking are required to pay. Most of these examples of more equitable zoning strategies revolve around increasing affordability—a first essential step toward desegregation and shared prosperity. Other strategies like improving access to public services and a more equitable distribution of public infrastructure investments must also be addressed to develop a truly equitable community. Here are Smart Growth America, our motto—improving lives by improving communities—refers to all lives. While zoning has historically been a tool for separating people, it can be used to raise all boats in the community, regardless of a person’s age, race, ability, gender, or income. Zoning reform won’t create an equitable city by itself, but communities across the nation are using it as a crucial tool to remedy past wrongs and open up additional policy options for a more equitable future. No Zoning for equity: raising all boats classes are currently scheduled. Contact FBCI to learn more about upcoming classes, or browse recorded webinars for learning opportunities available online anytime. The Town of Clarksville’s Redevelopment Department is hereby accepting proposals from qualified professionals to create a Master Plan focusing on the redevelopment and infill development of a 600-acre study area. The study area has served as a retail and restaurant hub for Southern Indiana and Louisville for decades. Interested firms and consultants should have significant expertise and abilities in mixed-use redevelopment, adaptive re-use, and urban resiliency planning. Firms should also have a record of successful promotion of mixed-income neighborhoods and developments. It is imperative that the study focus on a strategy to transition this predominantly commercial corridor into one which can effectively support residential development within the area and meet a wide range of citizens’ needs. Submissions due no later than 4:00 p.m. EST on April 10, 2019. No Redevelopment & Infill Master Plan Wanted for Clarksville, IN classes are currently scheduled. Contact FBCI to learn more about upcoming classes, or browse recorded webinars for learning opportunities available online anytime. The Chappaqua Hamlet is the subject of this RFP specifically because there is easy access to sewer and water infrastructure, other amenities and alternative transportation. In addition, the Town of New Castle is currently implementing a $15 million dollar update to the hamlet’s sewer, water and stormwater infrastructure, including new sidewalks, street lights, street trees and public gathering areas. The Chappaqua Hamlet is roughly 342 Acres, 72 of which are currently zoned for non-residential purposes. Approximately 10% of the land area (33 Acres) in the Chappaqua Hamlet is owned by the Town of New Castle with roughly 12 Acres of the Town-owned property located adjacent to the Metro- North train tracks, which serves as surface parking for commuters who take the train to New York City. The commercial core of the hamlet is located along Greeley Avenue, King Street and Allen Place. The vast majority of commercial use consists of retail stores, restaurants, office spaces and personal care stores, such as dry cleaners and nail salons. In addition to being a stop along the rail- line, the Chappaqua Hamlet is also home to the New Castle Town Hall and Police Department, the New Castle Historical Society, the Chappaqua Library, Bell Middle School, the New Castle Community Center and the New Castle Recreation Field. As such, the Chappaqua Hamlet is not just a retail core, but consists of many community facilities as well. The Town of New Castle is looking for revised legislation that will meet the reality of main street development today and should include commercial and residential uses. Consistent with the Comprehensive Plan, the future vision includes transit oriented development and may include different standards for properties aligning Town/County/State roadways (the commercial core) as opposed to areas within the existing train station parking lots or the existing residential areas in the hamlet. It is envisioned that the legislation will be provided in both visual and textual forms. Specific elements of the legislation should address street frontage, street wall, overall height of buildings and open space. Details regarding building alignment, setback and height variation should be included and ultimately care should be provided to break up overall massing. First floor elevations should include elements that relate to the pedestrian experience (e.g. doors, windows, projections, columns, awning and canopies, ornaments, outdoor cafes). Existing surface parking quantities in the Chappaqua Hamlet must be maintained. No net loss of parking amounts is acceptable. The legislation should include examination of current parking standards, shared use and non-competing uses. Proposals must be received by 4:30 PM Friday, January 25, 2019. The full RFQ is available on the Town of New Castle’s website. No Town of New Castle, NY Seeks Form-Based Code for Chappaqua Hamlet classes are currently scheduled. Contact FBCI to learn more about upcoming classes, or browse recorded webinars for learning opportunities available online anytime. After two years of robust education and community engagement, the City of Las Vegas is ready to implement their downtown master plan, using a new a form-based zoning code. The city credits our Form-Based Codes Institute’s comprehensive three-course curriculum for helping to achieve this first-of-a-kind achievement in Nevada, which city officials believe will lead to a compact, vibrant downtown to support future growth. When Las Vegas adopted its downtown master plan in 2016, the city was confident in its vision to re-energize its fading downtown. Long overshadowed by the famous Strip to the south, downtown was envisioned as a lively, mixed-use environment centered around transit hubs and activity nodes; “a legend reinvented,” as the city’s vision website professes. Of the many recommendations laid out in the master plan for realizing this reinvention, one stood out: the adoption of a form-based code. Planning staff and City Council members scratched their heads. A handful had a rough idea of what a form-based code is, but few knew how a form-based code really works, let alone how to implement one. The city called upon Lisa Wise Consulting (LWC)—member of FBCI—to help city leaders and staff understand how the right kind of zoning would help them create the human-scaled, walkable, mixed-use development they were after. In 2017, the firm was retained to craft Nevada’s first form-based code. 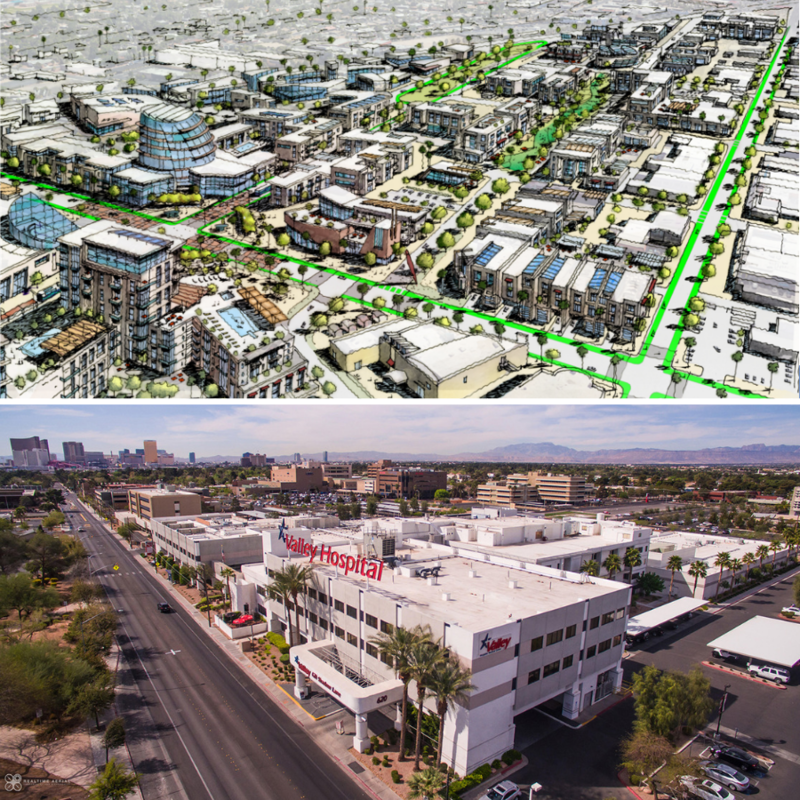 The master plan for Downtown Las Vegas identified 12 distinctly different districts—including the historic west end, an arts district, and a medical campus—with a wide range of demographics and character. Drafting a new zoning code that embraced those differences wouldn’t be easy, especially with the city’s limited budget. LWC made it clear to the planning staff that it was essential for them to understand how form-based codes work and what would be required for sound implementation. Peter Park and Lisa Wise discuss advanced topics of form-based codes during FBC 301. While LWC grappled with drafting a versatile framework for a multi-district code, the city brought in FBCI to handle the education component. FBCI’s three-course curriculum ensured that everyone who would review, adopt, or implement the code understood the principles behind it and how it worked. Classes were attended by a range of people, from members of the public curious about the basics of form-based codes, to an advanced group of planning staff and local developers eager to master the complexities of administration and adoption. Classes also attracted city councilors, planning commissioners, architects, and affordable housing advocates. In all, the city hosted five courses over 18 months and reached close to 100 people. Out of the 2,700 acres in the master plan, the city flagged the Medical District as a priority. It was motivated to become the premier medical campus in the southwestern United States, had unique building types, and competitive development was encroaching. Property owners were working together on a district-wide parking policy and developers eagerly awaited a much less cumbersome approval process. They knew a form-based code could provide a straightforward framework for their development plans and expedite approvals – it was exactly what they needed. The Las Vegas Medical District Form-Based Code was officially adopted on October 19, 2018. It includes development standards and building types that fit in with the University of Nevada Las Vegas medical school, doctors’ offices, and two large hospitals. The code encourages walkable design, a variety of building types and development styles, and a diversity of uses all of which provide visual interest while preserving the district’s desired character. 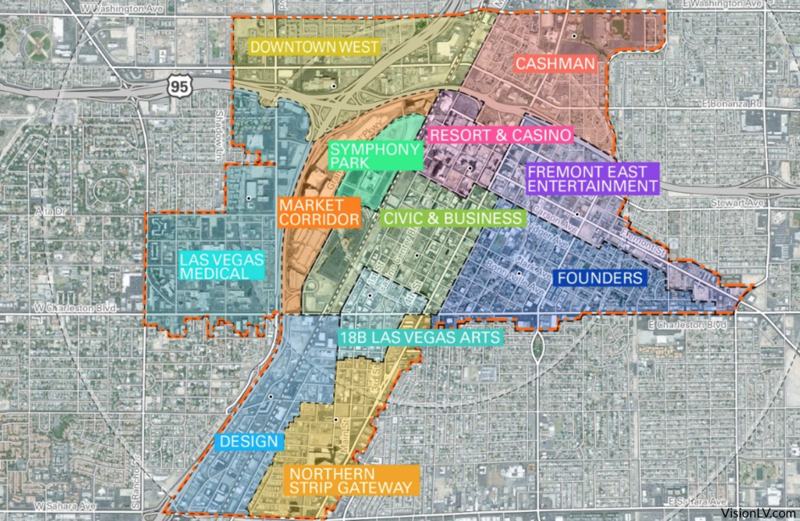 LWC is now working on district-specific standards for the Fremont East District—the city’s smaller, mixed-use entertainment hub—before continuing on to the 18b Arts District and the Historic Downtown West District. When these are completed, the reins will be passed to the Las Vegas Planning Department where staff will draw on what they learned in FBCI’s classes to complete specifics for the eight remaining districts. Las Vegas has taken a major step forward in realizing its vision for their downtown by updating their zoning to support the kind of walkable, human-scaled city the will help it attract and retain residents. Changes to local land use regulations can be contentious, but cities are changing, growing with new residents and a greater understanding of how to create sustainable (both economically and environmentally) and equitable communities. FBCI’s classes can equip planning staff, elected officials, and residents alike with the skills and capacity needed to embrace change, effectively manage growth, and create great places. No Downtown Las Vegas: “The legend reinvented” classes are currently scheduled. Contact FBCI to learn more about upcoming classes, or browse recorded webinars for learning opportunities available online anytime. Zoning codes are the unseen, yet decisive guiding force that can either help or hinder the creation of great, walkable, people-scaled places. This primer gives you the basics on form-based codes: what they are, where they work, and how they can help create and sustain great places. Take a look at just about any city in America and you’ll see that there is pent-up demand for walkable, people-oriented places. Millennials are more likely to want to live in cities where they can get around without a car and baby boomers are finding great convenience in being able to walk to their destinations as they age. Unfortunately, in many places the kind of diverse, walkable environments that people desire are also illegal. In Cleveland, OH for example, mixed-use buildings that hug the sidewalk are only possible by getting special exceptions from the city’s zoning. And in New York City, two out of every five building in Manhattan couldn’t be built with the city’s current zoning because they’re too tall, have too many apartments, or too many business. The same can be said about many places around the country—like Mount Rainier, MD and Lexington, KY—where communities were built before the advent of modern zoning. To try and remove barriers to walkable communities and take a more holistic view of all the elements that make a great place, some cities are adopting form-based codes for their entire city or various neighborhoods. But what is a form-based code, exactly? We put together this short FAQ to answer that question. What’s the difference between a conventional zoning code and a form-based code? Conventional zoning is primarily focused on what happens inside the buildings—the uses. That’s how different zones get their names, like “single-family residential,” “multifamily residential,” “industrial,” or “retail/commercial” for example. With such zoning, the quality, scale, character, and design of buildings and blocks, which are so important for creating great places, take a back seat to what’s happening inside the buildings—if they’re even considered at all. And the character of streets and other public spaces around development are never addressed. Most conventional zoning fails to encourage walkable, mixed-use development because it’s designed to separate uses. A form-based code on the other hand focuses first on the shape and scale of the buildings and blocks, as well as the features of the streets and other public spaces. And because a form-based code starts with a community vision or plan, these codes are more likely to preserve the features and character that community members cherish. They also encourage the mix of uses and walkability that is so important for vibrant places. Where are there examples of successful form-based codes? Large Cities: Denver, CO; Miami, FL; and Nashville, TN. Small Cities: Delray Beach, FL; Benicia, CA; Bellevue, KY; and Bradenton (FL). Neighborhoods and Districts: Fort Worth’s Near Southside (TX) and Pleasant Hill BART station area (CA). What kinds of communities adopt form-based codes? Albeit not a one-size-fits-all approach, form-based codes are helping all kinds of communities unlock a vision for vibrant, human-scaled environments. They are adopted in places where people want walkable streets, hospitable buildings, and lasting character—goals which are easier to accomplish with a form-based code. Communities also pursue form-based codes when development is stagnant, takes too long, or is unpredictable. More often than not, these issues arise because of an overly restrictive conventional code keeps mixed-use, walkable development on the wish list. What is the role of form-based codes in gentrification or displacement? Zoning alone—conventional or form-based—does not cause or solve problems associated with gentrification leading to displacement of long-term residents or businesses. Typically, a host of issues—driven by market forces—are the root of displacement. Form-based codes often result in an increase in property values, because the kinds of places they create are both in demand and scarce. It is up to policymakers to decide how to mitigate these market forces so existing businesses and residents can remain in place as communities grow. In some cases, form-based codes can actually add to the toolbox to retain existing residents and businesses. For example, in many cities, single-family zoning includes minimum square footage and/or lot size requirements, increasing the cost of a home and restricting who can afford to live there. A form-based code can be used to diversify building sizes and types in a neighborhood, introduce affordable housing incentives, and set development standards to reduce exclusionary requirements. Aren’t form-based codes more costly than traditional zoning? The cost of drafting or updating any zoning code varies, depending on the size and complexity of the area to be covered—from a single neighborhood or corridor to an entire city. Unlike conventional codes, form-based codes are written to reflect the community’s vision of the area; if this prerequisite is not in place, the cost of developing it is sometimes incorporated into the code drafting project. How can we educate people about/advocate for form-based codes with our elected leaders and citizens? The Form-Based Codes Institute (FBCI) is a program of Smart Growth America, led by planning and land-use professionals. We use education, technical assistance, and research to promote the understanding and adoption of form-based zoning codes. FBC 101: The ABC’s of Form-Based Codes: Provides a comprehensive understanding of form-based codes, their history, components, legal underpinnings, and applications and how they differ from conventional codes. FBC 201: Placemaking with Form-Based Codes: Conveys how to create and use standards for building form, streets, and public open space within a regulating plan. FBC 301: Adopting and Implementing a Form- Based Code: Teaches practitioners how to formulate, adopt, and administer a form-based code. For more information please contact us at 202.868.4103. No Have we zoned great, walkable places out of existence? classes are currently scheduled. Contact FBCI to learn more about upcoming classes, or browse recorded webinars for learning opportunities available online anytime.